Sunday 14th April sees the broadcast of the six-part 1975 Tom Baker story Genesis of the Daleks on Australian and New Zealand television. The story is the 14th instalment in the 50th Anniversary season of Doctor Who stories on the UKTV channel. The story is scheduled in New Zealand at 3:25pm and in Australia at 3:30pm . New Zealand has an additional screening on Monday 15th April at 3:20am. Genesis of the Daleks was first broadcast in Australia in 1977. New Zealand viewers didn't get to see the story for another decade - it was first screened by TVNZ in 1987. UKTV is showing stories throughout the year in the lead-up to the anniversary in November. 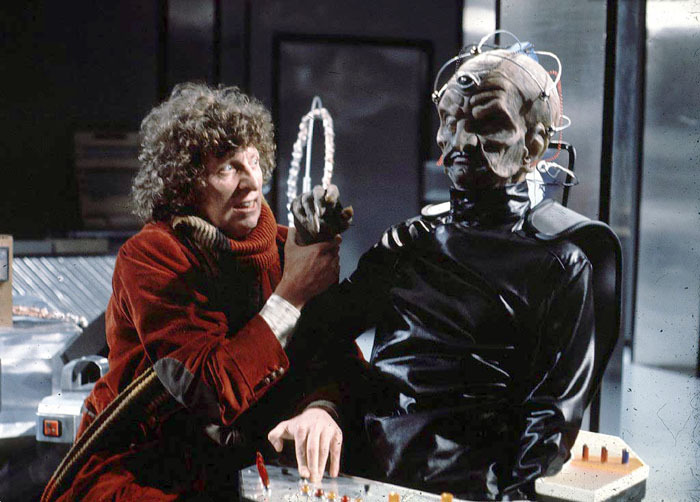 Genesis of the Daleks is the second in a set of six stories featuring Tom Baker's Doctor broadcast during April. The rest of the month's schedule includes: Pyramids of Mars and The Hand of Fear (both 21st April), and The Robots of Death and City of Death (both 28th April).